The creativity part is a bit further out. As for the horses, the ones left have a much better life than they used to have…. This entry was posted in Nerdy ruminations, The thoughtful manager on August 14, 2014 by Espen. What If the Administration Gets Involved? This entry was posted in Case teaching, Teaching and tagged Bill Schiano, Harvard Business Publishing, HBS Press, teachingwithcases on August 3, 2014 by Espen. 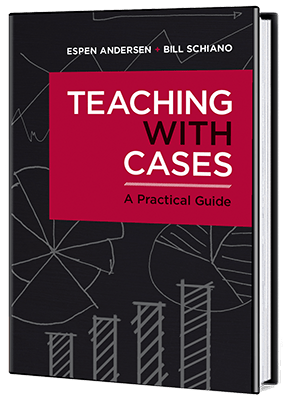 Bill Schiano and I have written a book, Teaching with Cases: A Practical Guide , officially launched today at Harvard Business Publishing, available as paperback or PDF (304 pages). The book is built around three concepts: Foundations (how to set up the course, contract with the students, and set up infrastructure); Flow (how to conduct the discussion in the classroom, manage time and boards, ask questions, and conclude discussions); and Feedback (how to design grading and feedback, especially participation grading.) We have extra chapters on dealing with difficult issues (much of it based on questions from participants in HBS’ case teaching seminars); how to teach quantitative and technical material; how to deal with differences in language and culture (foreign students and foreign teachers); how to prepare for the next course; how to foster case teaching at the school level (many business schools are now looking to better teaching, including case teaching, as a differentiator); and lastly, a long and detailed chapter on technologies for case teaching, including our views on how to teach cases online. The book also includes a collection of online resources (sample syllabi, sample teaching plans, etc.) for teachers, available at teachingwithcases.hbsp.harvard.edu. We hope to grow this collection as we hear from readers and build more material ourselves. This entry was posted in Academically speaking, Case teaching, Teaching and tagged Bill Schiano, Harvard Business Publishing, HBS Press, teachingwithcases on August 2, 2014 by Espen.